Join Inspiration Consultant at Tina Bartelmay at Big Sky Quilts for the Software and Hooping Clinic on either October 6 or October 7, 2017, 10:00 am to 2:00 pm. This is an opportunity to learn tricks and techniques to expand your machine embroidery creativity. Everyone is welcome to attend, you do not need to bring your machine, come ready to learn. REGISTER TODAY AS SEATING IS LIMITED!!! Registration for classes can be in person, by phone or on-line. When you register on-line for a class you will receive a follow up e-mail with the supply list. If you want to use a classroom machine call Big Sky Quilts to reserve a machine. This quilt may look like a traditional Bargello design has nothing in common with the traditional construction method. Only 2 fabrics are used in this project. Completed quilt is approximately 46” by 57”. Don’t wait to register for this popular class! Make fun and comfortable pajama pants using the pattern Sew Easy Pajama Pants by Cindy Taylor Oats. This class will use a regular sewing machine for the construction of the pants. This is a great project for beginner sewers and experienced sewers who are looking for gifts for birthdays and holidays. 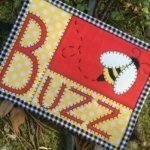 Buzz Mug Rug features a flying bumble bee over the word Buzz. This is a great mug rug for your home, sewing room, office, or as a gift for a friend. You can even send this as a postcard to someone special! Classic plaid and traditional woven tapestries inspired the patchwork plaid layout of the quilt. Class will construct a crib size quilt using 4 fabrics for the top and a coordinating kid friendly fabric for backing. Every Thursday, Friday and Saturday each week during the month of September there will be featured selected merchandise as a weekly special. Purchase one regular priced pattern, 2nd pattern 50% off. Pattern cannot be part of pre-packaged kit and must be equal or lesser price of regular priced pattern. Receive 25% off one regular priced notion when you spend $50.00 or more. Some restrictions apply. Ask a staff member to be sure an item qualifies.